The Association for Nepal and Himalayan Studies (ANHS) is the oldest academic organization devoted to the study of the Himalaya in the United States. HIMALAYA is the journal of the Association and its flagship publication. Back issues of HIMALAYA are freely available from a Digital Commons repository housed at Macalester College. Staff at Macalester’s DeWitt Wallace Library continue to support the journal by assisting with layout and workflow. The University Press of New England is responsible for the printing and distribution of HIMALAYA. Angie Hurlbut of AHdesign in New Haven created the journal’s new look. Kathmandu-based SoftNEP managed the implementation of the design online and continue to host the website. The Nepal Studies Association Newsletter was digitised by staff at the Yale University Library in 2013. Student assistants and interns at the Yale Himalaya Initiative have assisted with scanning and compressing the back issues of the journal to create a comprehensive digital archive. 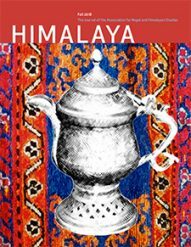 Through a partnership with Himal Books in Kathmandu, selected special issues of HIMALAYA are available in book format in Nepal and South Asia. The development of the journal HIMALAYA has been made possible over many years with support from various organizations. Most recently, the editors are grateful to the Shelley & Donald Rubin Foundation for a grant to assist with the journal’s digitization and online dissemination; to Dartmouth College for administrative and financial support; and to staff at the Macalester College library for their ongoing commitment to assisting with layout and page setting. As former editors of HIMALAYA, Arjun Guneratne and Barbara Brower have made a profound contribution to the establishment and growth of the journal. The current editors and grateful for and recognize their effort. Digital Himalaya is an online repository for multimedia anthropological information from the Himalayan region, including journals, maps, films and photographs. The International Association for Ladakh Studies disseminates information about proposed and completed research and publications.